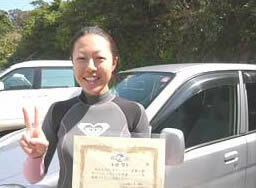 Experiencing surfing with an excellent teacher at this awesome Shirahama become such a good memory. It has been the influence for me to do more muscle training and try my best at riding the waves. I will definitely come again!! It was very fun. Thank you very much. I am customer K who took a lesson at this school with my family yesterday. The reason we took this school was for our children but we (especially my husband) become engrossed in surfing even more. I am hoping that from now on as well we can enjoy surfing together with our children. A big thanks to the teachers and staff. I took this school together with my girlfriend. We have only just begun but maybe because of the teacher`s kind instructions, surfing has become so much fun and we are going to the ocean every week. I`ll try my best not to be beaten by my girlfriend. Thank you very much. I was looked after well from Friday through to Sunday （^O^). It was a very cold weekend but we were able to enjoy body boarding and longboard and both were fun so I`m still contemplating. The staff are also very kind and I was able to enjoy my time there. I got into it just especially so I want to try my best and continue. Please look after me again next time. The weather was good, Shirahama`s ocean was very beautiful and it was a fun school. Thank you very much. I took the body board class. I was taught in a very easy to understand way and I was spoken to in a very caring way so I`m very appreciative to the two who taught me. The longboard team looks like they will be trying their best from now on too. Also, please take care of me when I`m in Shirahama again. I was taught yesterday at this surfing school. They taught very kindly and politely and it was very interesting. Recently I can only go to the ocean once a month but I want to continue surfing. Thank you very much. My friends are also saying that they want to come and be taught again so please look after when we do.